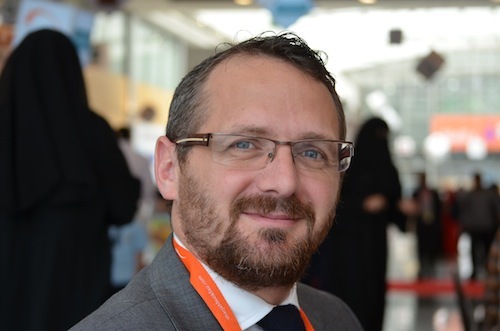 SHARJAH, UAE: If you want a good overview of what is happening in the Gulf states you could do worse than talk to Matt Cowdery, Hachette’s man in the Middle East. He has lived and worked in the UAE for five years and carried the bag for the publishing group since 2011. The region presents a kaleidoscope of different approaches and cultures that can make a salesman’s job both fascinating and frustrating. It seems that when it comes to the book industry in the GCC, an Arabic version of the famous Oscar Wilde line applies: it’s a case of 22 countries divided by a common language – except that even the language is far from common, with numerous regional variations as any translator will tell you. While excited school children poured into the Expo Centre for the Sharjah International Book Fair this week, Cowdery reflected on the past year. “There have been a lot of issues in the Gulf around importation certificates. You need these for every title and what we all want, of course, is a fast, clear and cheap process. We respect the cultural considerations of each territory, but we need to know how it works. It’s different in each country. In Saudi, for example, it’s clear, fast and efficient. But Qatar has gone the other way. There’s a bewildering, complex process of sending samples for the ministry there, and it can take up to two months by which time your book’s ‘window’ may have gone. So we tend to focus on less time-sensitive books there. He said the Arab Spring has led to the opening up of some markets and the decline of others. “Syria has gone to zero for obvious reasons, but we’re very strong in Lebanon on the back of that. Egypt has been heavily hit — the whole process of ordinary life has become difficult there. There are demos, curfews, the electricity supply goes down which can affect printing, there’s no good access to currency so payment becomes a problem, and just the whole simple process of shopping is harder. Having worked for numerous Waterstones branches in the UK, a desire to travel and an interest in the region brought him and his wife Stacy to Dubai in 2009. He worked for booksellers Magrudys at first, and then came the move to Hachette.